As 2016 rolls on we have our sixth release of the year, which means we’re half way through the WWE DVD year! As you have probably guessed, the latest WWE Home Video release looks at the controversial career of one Eric Bischoff. 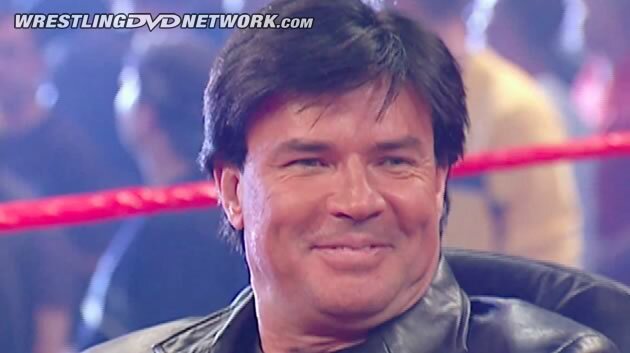 HE’S BACK: Click here to get your copy of WWE’s new Bischoff DVD, or here for the Blu-ray. Now, I can’t lie. I have been somewhat vocal about this release and the fact that I personally didn’t really feel it very necessary (find my ramblings as always over on Twitter @_MarkD_). In fact I was (to a degree) quite perplexed at how so many people could be excited for it! Going in I didn’t really think this was a WWE DVD we needed – frankly, I felt that we have heard the story of Eric Bischoff (at least the biggest part) in the pro-wrestling business with the near countless retellings of the Monday Night War and World Championship Wrestling. The documentary portion of the DVD, which we’re taking an in-depth look at today, has a runtime of 1 hour and 35 minutes and features comments from a number of personalities including Eric himself, his wife Loree, business partner (and ‘The Wonder Years’ star) Jason Hervey, Sonny Ono, Diamond Dallas Page, Kevin Nash, Greg Gagne, Steve Austin, Chris Jericho as well as archive interviews with the likes of Hulk Hogan and Scott Hall (among others). The open to the documentary is quite unique – you may have seen a sneak peek of it here at WrestlingDVDNetwork.com but if not watch it below. It features a montage of clips from past WWE DVD documentaries (specifically: The Monday Night War and The Rise & Fall of WCW) along with the recent WWE Network series: The Monday Night War. These clips featured individuals discussing and critiquing Eric Bischoff’s actions and decisions during his tenure with World Championship Wrestling before we cut to Eric who is all set to right these supposed wrongs. Typical of these documentaries, the story takes a chronological look back through Eric’s life and career including his childhood, martial arts history (with some cool footage from 1979 of Eric competing), his modeling days (where he met his wife) and his other early business ventures (including garden landscaping and Ninja Star Wars – which eventually led Eric into the wrestling business with the AWA). This part of the documentary was great. Much of this information was new so it was really very interesting and honestly warmed me right up towards the feature. Of course as we have come to expect with these WWE docs, the production values are as high as they can be. The quality of the video footage is fantastic – naturally this does vary with the older archive footage. Kudos always has to go out to WWE for these features; they always go the extra mile to unearth cool and unique footage, all of which adds so much to their presentations. Next up, the documentary looks at Eric’s tenure with the AWA and specifically delving into some of the different roles he undertook there with the company, which of course all eventually led him (after the AWA’s closure) to World Championship Wrestling. This was where I began to remember why I wasn’t really very exited about an Bischoff DVD! Eric’s rise to power in WCW is then documented (with comments from Bill Shaw and Dr. Harvey Schiller — then Turner Executives) during which we of course hear about Eric’s appointment as WCW’s executive producer and his further rise to the company’s executive vice president, the signing of Hulk Hogan (who is mentioned and shown in archive comments throughout by the way), the formation and original ideology behind Nitro and how they would compete with WWE. These stories were a little mundane; we have heard them all before and honestly their retelling here doesn’t really add too much to the pot. 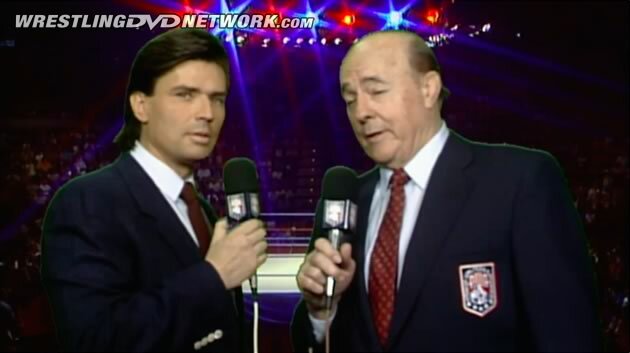 In fact we still hear the factually incorrect line about Ted Turner giving Eric 2 hours in prime time on TNT for Nitro (Nitro didn’t actually add a second hour until the week before Scott Hall first appeared in May — eight months after launching!). From this portion we head back into the opening of the DVD with all of the comments. Bizarrely, we aren’t given a truncated version of the over two minute segment – rather we’re presented the entire thing for the second time (in less than an hour!). This feels a little odd to be honest, I though there was an error at first. However, this doesn’t take away from how good this segment is. Sadly, I wish this idea was exploited a little more than it was. In fact it would have made a fantastic little 30 minute bonus feature all of its own to compliment the main feature with Eric Bischoff debunking lies and mistruths which have become wrestling lore over the past 20+ years. We move to the merger of Turner Broadcasting with Time Warner (and later AOL) and what this meant for WCW, ultimately leading to Eric’s outing in the fall of 1999, his sabbatical and return in the spring of 2000, then of course Eric’s attempts to purchase WCW and how everything went wrong. A cool story Eric shares, one that’s definitely a high point of the doc, recalls his first phone call from Vince McMahon in 2002, which ultimately lead to Eric becoming a part of WWE and RAW’s General Manager. His GM period is given a quick look over, but surprisingly we don’t get into much detail regarding the specific storylines etc. Next the feature looks at Bischoff-Hervey Entertainment, what they’re all about and Eric’s involvement with Jason Hervey. Unsurprisingly we don’t have any mentions of TNA nor Eric and his production company’s involvement with them. The documentary comes to a close with Eric sitting by a fire reflecting upon his ‘journey’ through pro-wrestling and recounting how his recent interview with JBL (which can be found on disc two) gave him clarity towards WWE, the Monday Night War and the outcome. Eric claims that he is content that WWE and Vince McMahon won the ‘war’ as no-one (himself included) has the commitment to the wrestling business that Vince does and he knows that in WWE’s hands WCW’s legacy and Eric’s own will remain for fans to discover many, many years to come (something that perhaps wouldn’t have happened had WWE and WCWs roles been reversed). In terms of the documentary folks, that is your lot. As I alluded to earlier I was very positively surprised with the documentary. My expectations weren’t too great for this one and I would have easily passed on it – but I’m kind of glad that I didn’t! On the whole I found the main feature an enjoyable 95 minutes. Granted we have heard some of the stories before, but who expected anything else? All in all, I believe you too will find “Eric Bischoff – Sports Entertainment’s Most Controversial Figure” a very enjoyable watch. The DVD/Blu-ray hits stores this Tuesday. A free preview just went up on the WWE Network! – USA: Tuesday! Lock in a pre-order here on Amazon.com or here on WWEShop.com. – UK/Europe: June 13th. Get your pre-order in right now here on Amazon.co.uk. – Australia: June 22nd. Get your pre-order in right now over at Madman.com.au. Hulk Hogan is not mentioned. His feud with Stone Cold is emitted. Eugene and all that stuff, gone. There is no interview with Vince to show the WWE’s side of events, or his opinion with him. Paul Heyman and ECW ignored entirely. There is just far too much missing for this to be a definitive documentary. Its watchable once, but lacks that replay value. It does have the special feature interviews from the network however that ups its running time considerably. Decent effort with this one, WWE. My Blu-Ray copy haven’t shipped yet by Amazon.ca and I preordered it in February… WTH? Thanks for the review; I still feel the same about this not being all that necessary though. And I do feel that a fleeting mention of TNA (a la the Sting and Dudleys WWE sets) would have made it feel more complete. Are you going to review the US Title dvd, mark?